President Donald Trump and first lady Melania Trump look at the North Carolina grown Fraser Fir Christmas tree at the North Portico as it makes its way to the Blue Room for display at the White House on Nov. 19, 2018, in Washington, DC. (CNN) - It's time to deck the halls: The holiday season officially kicked off at the White House Monday when President Donald Trump and first lady Melania Trump received the 2018 White House Christmas tree. The tree arrived at the North Portico of the White House by jingle bell-adorned horse and carriage, continuing an annual tradition. 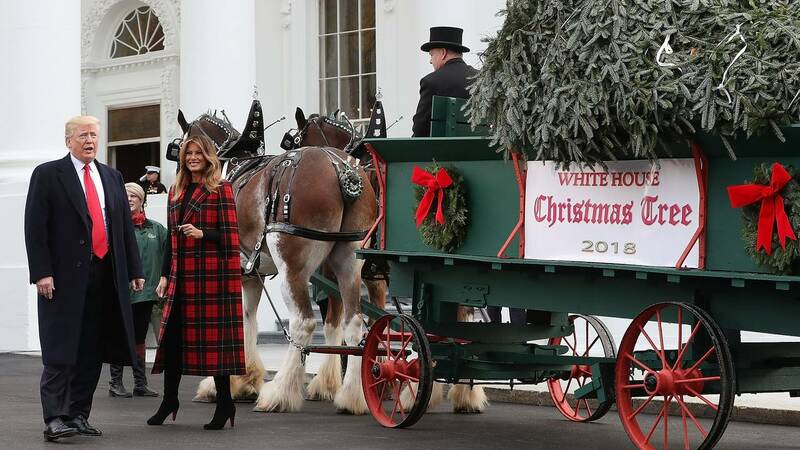 The Trumps, both dressed festively in red, surveyed the tree as a military band played Christmas carols, walking hand-in-hand as they inspected the carriage's cargo. This year's tree, standing 19-and-a-half-feet tall, hails from Mountain Top Fraser Fir farm in Newland, North Carolina, and will be displayed in the Blue Room. The President, not traditionally present for the tree's arrival, made a special appearance this year, offering a pat to one horse and a wave to the assembled press. Mountain Top Fraser Fir's Larry Smith was named "Grand Champion" in the tree association's contest last summer, his fifth attempt to win the honor of providing a tree to the White House, according to the National Christmas Tree Association.